Ten Strawberry Street Round Lacquer Beaded Gold Charger Plate 13"
Home > Products > Ten Strawberry Street Round Lacquer Beaded Gold Charger Plate 13"
Use the Ten Strawberry Street Round Gold Beaded Lacquer Charger Plate 13" for presenting salads, soups, entrees, or desserts. Boasting a delicate beaded pattern around its rim, this lavish gold charger plate will surely impress guests with its charm and sophistication. 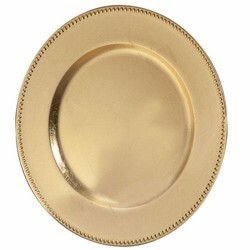 An excellent addition to wedding receptions, upscale parties, and celebratory occasions, this round charger plate is made from premium quality lacquer for unbeatable durability. This highly durable charger plate accommodates any size dinner plate.